St Petersburg Tram CSL Sedan Powering by Scott Ruffinen with additional photos by Q-Car and Ron Hastie. This completed determine what height you want your floor above the track level; making sure that there is clearance between the wheels and the bottom of the car floor. Cut the power truck stubs (feet) to achieve this height. After mounting your power truck bolster and checking the truck fit if you find the floor is too close to your wheels you can raise the floor (and the car body) by inserting washers between both the truck, and the car bolsters. If the floor is too high you can add washers between the bolster feet and the car floor. This will lower the floor. Lowering the car at the trailer truck end is more involved. Small reductions in height can be made by filing off the round load bearing surfaces of the truck and car bolster. If this is not enough, use a thinner bolster. Don't be afraid to discard your commercially made bolsters, and substituting a thin strip of brass, or wood stock. Commercial bolsters are not sacred; car to rail height should be! Once the power truck bolster is mounted, the truck is attached with the elastic stop nut provided. (The trailer truck uses a 3-48 x 1/2" filister head screw.) Do not over tighten this nut or screw. A little slack will allow your truck to ride over uneven track. To prevent your car from flopping from side to side just keep the trailer truck mounted on the snug side. If this is a conversion you can place the spring that is supplied on most imported trucks between the nut, and the bolster. This will allow the truck some up and down movement without the worry that you have made the nut too tight. Just put enough compression in the spring that it holds the truck firmly in place. If this is done correctly it will keep the car laterally stable. If you have derailments on un-even track, make your adjustments at the trailer truck, or if that fails, losen the elastic stop nut a little. 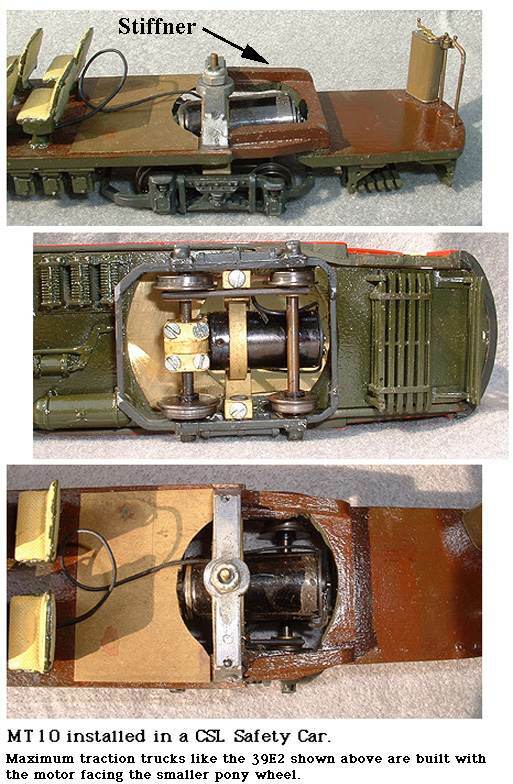 Please note in the top view photo (on the right-above) that the gear box end of the floor cutout hole does not extend to the end of the gearbox. The gear box is low enough in most cases to end up UNDER the floor, depending on the truck. This may not be true for 30-1 gear boxes. 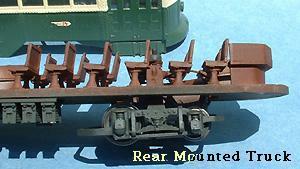 The second scribed line in the above photos would be for units with a 1630 motor. Our current drives use 1628 motors. On many installations, because of the low level nature of our MT10LP drives you can mount the truck completely underfloor by omitting the bolster, and mounting the truck directly to the car floor. Bolsters were used on the prototype to distribute half the car weight onto each truck and thence to the rails. In modeling work this isn't necessary. Most car floors, be they brass or wood (assuming a minimum of .015" Brass or .125 wood) can easily support the weight of the car without a bolster. If room permits on wood floors, thin washers or an 010" flat plate can be used as a bolster to prevent the wood from wearing down. We do provide both a power, and a trailer truck bolster with all of our assembled trucks. The bolster provided with the MT10LP type of truck can be rotated to either gain a little height (approximately .032") or take some height away should there be enough room to use this bolster. Back to the Page Index. "I put the trucks in both positions w/o a problem, but I do weight the SPTC cars with up to 2 oz of lead weight depending on the model and whether or not I change out the seats. Most of the time I put in 1 oz of weight in 1/4 oz lead pieces-distributed front and back and under the center of the car; if I use Q seats, then no weight is required. But I only did that in one car. In the past I always put the trucks in the front, especially the Wagner open frame dc60 units. After the can motor swap over in the 70's-80's, the "magnitraction" disappeared. This was especially noticeable on the subway incline. So, I have put the truck in the rear on any car expected to pull a trailer. For the same reason I have always used steel rail as opposed to nickle-silver. Even Roslindale [Boston Club] capitulated and went to steel rail for their new layout in 1979-present. Our own preference is to put the truck in the rear of single ended cars. Typically there is more room in that loaction, and enough seats to hide the motors intrusion into the car body; and there is no dropped platform to deal with. One way of wiring your power truck for overhead operation is to use pole reverse. One motor lead is attached to the pole base; the other motor lead to the other pole base. BOTH bolsters are grounded in common (wired together) with both pole hold-down hooks. When one pole is up the car will run in one direction. When it is lowered and the second pole is raised the car will travel in the opposite direction. (If the car wants to run the wrong way (against the pole) just reverse each pole base connection. If you are installing a double motor unit MAKE SURE BOTH UNITS ARE RUNNING IN THE SAME DIRECTION. A simpler method of wiring is shown to the left. Note that both bolsters are grounded together. In overhead operation this should always be done. If you are installing double motor units (including Magic Carpets) they can be wired in series or parallel. For the latter (parallel) one motor lead from each power unit is connected together (making two leads out of the original four). See right. In series operation one motor lead is connected to the second motor lead. See right. With this arrangement current passes through one motor to the other. This may cause one motor unit to run slower or faster than the other. However, under operating conditions (under load) motor speed and consequently motor power will balance out. As the speed (load) changes in one unit a corresponding change takes place in the second unit. We do not recommend putting more than two motors in series in any one car. In multiple motor installations make certain that each power unit is running in the SAME DIRECTION. This is especially true for Magic Carpets - two motor units in the same truck fighting each other can destroy gears or motors. Switch your electrical connections until both are operating in the same direction. One motor lead is wired to each car bolster. (On metal floors the bolsters must be insulated from the floor, or the truck must be insulated from the TRUCK bolster.) Also, if couplers are used on metal floors that carry one pole or the other, they must be insulated from that floor. Make certain that the insulated wheels of each truck are on OPPOSITE rails. In this way, one truck is positive, one is negative. 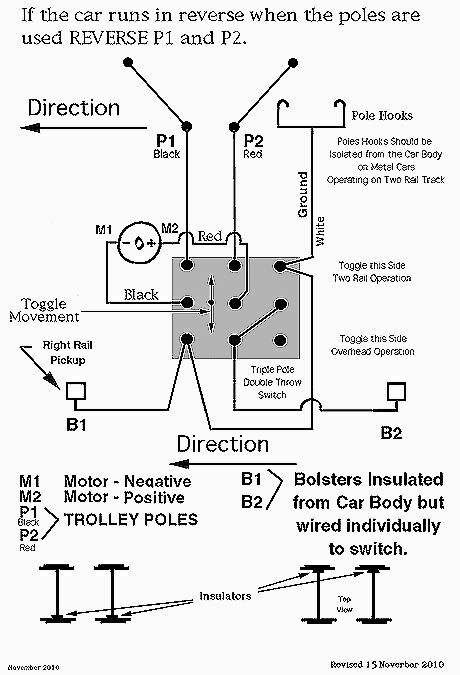 If pole reverse is not required follow the diagram for the Single Ended Cars and just wire in a second pole. Click on image to enlarge and to see the latest update. In any of the above wiring schemes you can install a car switch between the motor(s) and the power source. This will allow you to de-energize a car without the need for block sections. One way we recommend attaching motor leads to your car is to solder them to small washers. 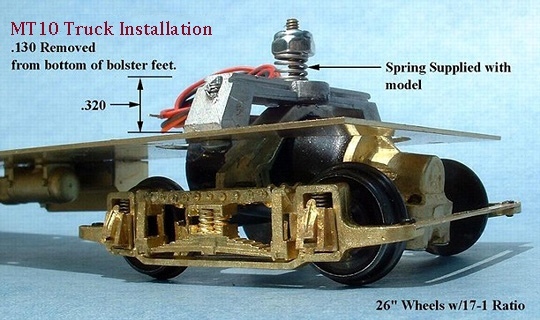 These in turn can be attached with screws at some buss point (wood screws into the car floor - or direct to the trolley pole screws) and removed easier than if solid wire to wire connections are made. A slot can also be cut into the washer making it even easier to attach and remove (see dotted lines). These openings are approximate. They will work in most applications. The rule is to make the hole smaller than you need and adjust the size after trial fitting the truck in place. We use a course "rat-tail" (round) or half round file to adjust the opening. Remember you must drill and tap the bolster. We recommend 2-56 size screws. If you do not have a 2-56 tap you can drill the bolster with a 1.9mm drill bit and use an ordinary 2-56 screw as the tap. The soft nature of white metal will allow the screw to make its own treads. These cutouts are NOT for MT10LP type trucks. As stated above most of those trucks will be underfloor. REMEMBER, as you trim the bolster "feet" the hole spacing between these feet change; the more you remove the closer the spacing dimension becomes. Cut the bolster "feet" BEFORE you drill the bolster out. If you download the cutout image as a pattern adjust it's size to match the dimensions shown on the drawing. These are NOT to scale. Can motors are described with a four digit number. As an example, our current motor is a 1628 can motor manufactured by the Mashima Company of Japan. The first two digits "16" represent the diameter in millimeters, and the second two digits "28" represents the length. A Millimeter equals approximately .0394 inches.